Jens, this is the information I recieved from one of the two individuals that are currently importing the Redstones. I am in Canada, if you are as well I can help you out. If you are in the U.S. I will pass you over to my associate there, Joel Koch, who has Redstones there. I have a supply of them here, below is some technical data on them. Price on an engine is $2495 Cdn. One of these engines is capable of from about 10-12 HP continuous operation, up to about 24 HP, continuous. either an st10 or st12 head. there will be nothing that will touch it in the listeroid world for economy"
Horizontal, single cylinder, two flywheel, electric start, water-cooled slow-speed diesel engine with alternator AND water pump. We did some tests, and even at 1100 RPM, it did a good job. They are a "modern" engine in that they have an enclosed valve train, are self oiling, etc. They have a counterbalance shaft and the one I have seen run had no vibration from 900-1000 RPM to the top of its range (about 1500 RPM.). All reports so far is they are an extremely strong, durable engine. The main bearing on the crankshaft, (drive) side is almost 7" in diameter, and 1 1/2" wide!! The engine holds about 14 quarts of oil, so this is no tiny pup!! You also get spare parts, such as a ring set, large end rod bearing, head gasket, set of valves, and a few special tools, such as the flywheel puller. We also stock the "PS" (good) ST heads as well, in 5, 7.5, 10, 12, 20, and 30 KW sizes. 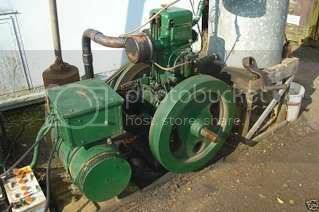 If you are looking for lower cost diesel engines, we have those as well. Please see http://www.utterpower.com/blackstone.htm , for a very similar engine. Hope this gets you pointed in the right direction. Mike H.
I've also received a similar reply regarding these engines. I was not comfortable with the concept that there on only two sources for parts in North America. I specifically asked Mike who was building them because I wanted to do some homework on the manufacturer and see what else they built and wanted to find out about other's experiences with their products. They were not willing to share who is building them as they were concerned that their investment in these engines and developing this market would be compromised. I understood, but was still disappointed as I'm not willing to buy something like this for this amount of money if I don't have multiple parts sources. Looks like a darn nice engine though! and it just sits there like it was bounded to the ground. if i had need for the kind of power it is capable of i would have a pair of them now for myself! who know's, i might change my mind should my needs increase for more power. it is a quantum leap over any listeriod certainly, and in my opinion a large leap over even an original lister twin. money for a listeroid twin. in my opinion as delivered they are very good at 12-1300rpm. barrier with very little work, and possibly much better than that. if one gets a chance to see one run it will surely put a big smile on the face! And one more, how can be possible just with one counter balance shaft?Â Â Is there another hidden inside the crankcase to keep engine from hopping up and down if using one balance shaft? Counter balance shafts tend to be in pairs for 1, 2 and 4 cylinders engines. And one more,Â 12, 23HP is kind of large, won't there be smaller versions that is about half that even 8hp at less rpm for quietness, 9hp at max rpm? And apogee_man had good points on multiple sources of makes for parts, back in the old days (pre 8088 era),Â IBM had same concerns because only one maker that IBM wanted to use ICs was Intel and IBM had good sense to insist on at least two sources of same parts from different makers.Â Governments had same concerns back then as well before that too. Mobile_bob, how is the thumping vibration transmission into ground with this running of redstone especially under load? to load down nice and hard,, no noticable thumbing that i recall. it has a single counterbalance shaft and makes very good use of it. personally i don't expect there will be a need for near as many repair parts as is common with listeroids. Can one explain how this possible to have one counter balance shaft work out with one cyl? Is it only to cancel the crank "slider" viberation motion because crank is 100% balanced to the piston/rod weight? swing together, so it would follow that if the changfa had room it too could work with a single counterweight. it doesn't have room so it uses two smaller weights to = one larger weight. the horizontal plane (piston/rod/crank) and the out of phase is taken care of with the counter balance shaft(s). that would make sense to me. Which country do these originate from ? The engines are manufactured in China. For those of you worried about parts only being available from two sources, we will have them at a reasonable price. Wizard, we did not want to get into the "multiple offering" situation that the Listers have fallen into. Part of that was cost - it is expensive to bring in new type of engine and hold stock until they begin to sell - but more importantly, who really knows if they need a 6, 8, 10, 12, 14, 16, 20, 24 or 28hp engine? Do you want a "standard" Lister or a GM90? Allowing for the wide range in the one engine can satisfy a variety of people and has the added bonus of being scalable if a person's need for power increases. 2 x 6/1 JKSON. 1 x 10/1 JKSON, 1 x 27hp Changfa, 1 x 28hp AG295, 1 genuine 1939 SOM, a couple of others in test mode and a Hercules Multu-fuel still in the box. Still, I'm curious about this balancing set up it was designed this way. It is first time I seen this done with one balance shaft. What is reason for horizontal instead vs vertical in inital design of this redstone? Is this possible to redo the governor linkage? This looks bit awkward for a V shaped linkage with pivot point at a ventex of "V" (greatest stress therefore greater friction) and governor's spinning round point bearing on the linkage will wear a pit in the linkage's flat side (?). Pit will make the motion jerky/possible sticking point. It is a fact I see all the time in mechanical stuff using this design not just for governors, this design is also used for static discharging a spinning assembly or to control some kind of mechanical within a spinning assembly via the sprung rod round point (pressing on the tip or let up pressure on it) that slides within the drilled shaft. And one more let us know how the testing goes with 900rpm (around 8-10hp) long term run for ones who only need 4-6KW? I could see a way to cut back to 3 gears instead of 5 if one is willing to cut larger gears with same pitch and put governor on the cam gear or on balance shaft gear and use a more straighter governor linkage. Steve...I don't think it's any secret where you can get chinese twin flywheel engines like the "redstone". http://www.gasgoo.com/auto-parts-trade/product-detail-LKLPQOO/aftermarket-Double-Flywheel-Diesel-Engine.html That's just one example that took less than a minute to find. The real trick is to be able to import it yourself economically enough. You got that one just a bit wrong. The real question is - can you import a QUALITY unit without investing a whole lot of money first?